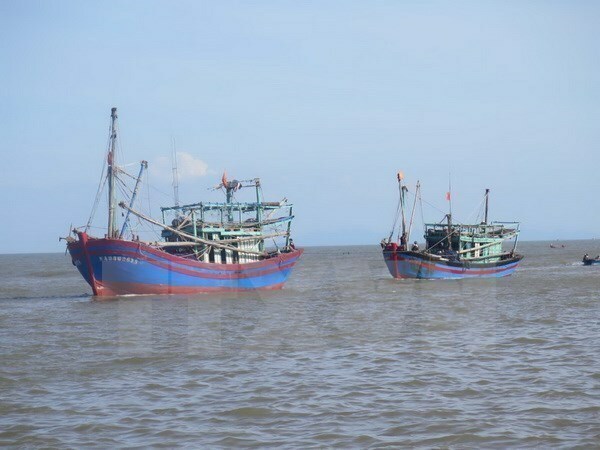 Binh Thuan (VNA) – The south central province of Binh Thuan has taken actions to stop local fishermen fishing in foreign seas, a problem which has cropped up often recently. The provincial People’s Committee issued a document on August 25 on measures to prevent the violations by local fishing boats and fishermen. The document requested relevant agencies and local administrations closely manage boats and fishermen, reprimand violators in front of local communities, and force boat owners and captains to agree not to infringe on foreign waters. Local People’s Committees were directed to monitor and prevent violations while disciplining communal officials whose irresponsibility results in local fishermen infringing on foreign seas. Binh Thuan also ordered the provincial Department of Agriculture and Rural Development to revoke fishing licenses and captain and chief mechanic certificates from those linked with violations. It will also not license fishing or approve new registrations for boat owners who previously infringed on foreign waters and were arrested by other countries. The provincial People’s Committee said since late 2015, violations of foreign waters to fish and purchase seafood and the detention and punishment of fishing boats and fishermen by regional countries have become complicated. It admitted several shortcomings in violation prevention such as lax punishment and sloppy work from local administrations.